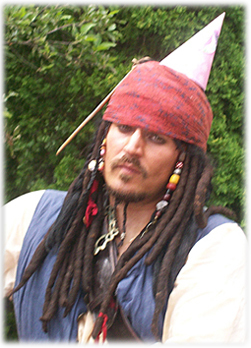 Children's Parties- For Birthdays, graduations, or any other reason you can think of, I'll arrive in full gear and teach the lads and lasses how to be pirates, put them through Pirate Basic Training, swear them all in as honorary members of the crew, and lead them on a hunt for any hidden treasure you provide. Adult Parties- Mingling and having a good time is what adult parties are all about. I'll mix with your guests, act as guest bartender, run any games you have planned and generally make sure everyone is enjoying themselves. Special Appearances- So you may not have a whole party planned, but I'm happy to make a surprise appearance for someone special. If you have a gift or flowers you'd like me to present, I can do that too. Guided Tours- I've learned a thing or two over the years and enjoy the chance to take your group around to piraty locales to share my knowledge with you. Excellent for Scout Troops, School field trips or team/club outings. School Visits- Unlike most pirates, I actually know how to read. On a visit to a school, depending on what grade I'll be visiting, I can read from children's books about pirates, or give a short lesson with questions and answers. So how, you may ask, do these parties generally run? Well I'll tell you. First of all, I do not plan the actual event for you. If you are looking for suggestions I am happy to oblige. When you first contact me, I will ask you some questions about your party or event: How many people, what age range, what type of event, where and when it will be held and at about what time you would need me there. If possible, contact me a few weeks before your event so that we can get everything squared away with room to spare. I will send you an agreement form ahead of time. This form is meant to protect the both of us so no worries. We can stay in contact via email until the week of the event. I will call you a day or two before hand to go over last minute details. I will then arrive on the day of the event 10-15 minutes early to meet you outside. After that the details vary. I am in full costume voice and character throughout the event, interacting with guests, taking pictures, leading treasure hunts, etc. I will not do anything that puts me or a guest in danger, nor will I submit myself to having things thrown at me, poured on me, splattered on me or detonated near me. You get the picture. I reserve the right to deny any request I deem inappropriate or unsafe. Wouldn't you? If you are at all concerned about conduct, don't be. Take a look at my Pirate's Code page and rest easy. You're in good hands. * Disclaimer: This site is intended as a character parody. The characters including, but not limited to Captain Jack Sparrow, as well as the title "Pirates of the Caribbean" are TM and © (or copyright) by Walt Disney, Jerry Bruckheimer and its related entities. All rights reserved. Any reproduction, duplication or distribution of these materials in any form is prohibited. This web site, its operators and any content on this site relating to "Pirates of the Caribbean" are not authorized by Walt Disney, Bruckheimer Productions, or any of its related entities. We are not affiliated in any way, nor do we by fact or inference imply to hold any rights or authorization, rights of association or sponsorship or endorsement of the use of any copyrights or trademarks as held by any individuals, or companies mentioned or pictured in association with any offer, including, but not limited to Walt Disney, Jerry Bruckheimer and its related entities.